Stripey Horse has found its home! There is a lot going on around this fella. 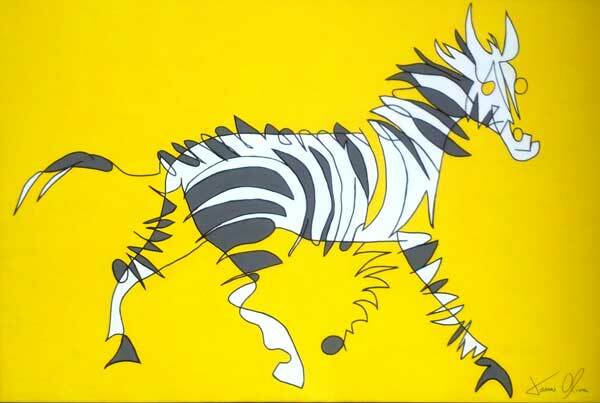 The funds from selling Stripey Horse the painting have gone to finance my first Jason Oliva [Wine] Project! Ever since my first art show ten years when all of my decorated wine bottles were brought home and displayed by guests I have wanted to produce my own wine with my art on the label. I have partnered up with the amazing and talented South African Wine Maker Dirk Roos of Mooiplaas and we have created an amazing 2008 merlot cab/franc blend. ‘Stripey Horse’ will be 250 bottles all hand signed and numbered by me arriving in September and almost half have already pre sold. If anyone is interested in more information and cost please feel free to email me at jasonoliva@gmail.com . I am so excited about this project it is a ten year dream come true! Click to join the Jason Oliva [Wine] mailing list and be eligible for all future offerings! Previous NEW!! Limited Edition 'Works On Paper' based on sold paintings by Jason Oliva all hand painted signed and numbered by Jason Oliva, Buddha and Eiffel Tower are first up.